We are not a capitalist society on earth. We are mutual aid societies ravaged by capitalism. 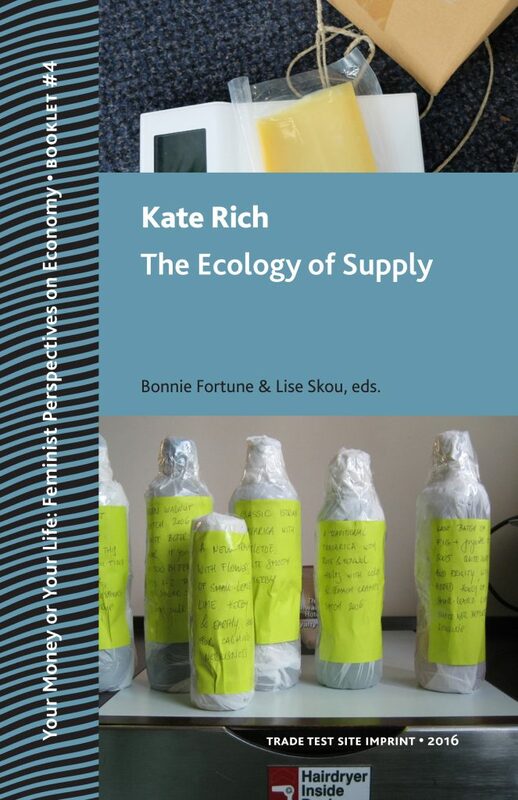 This series of short essays presents research, ideas, and proposals from four scholars and artists on contemporary life lived in the throes of global capitalism. 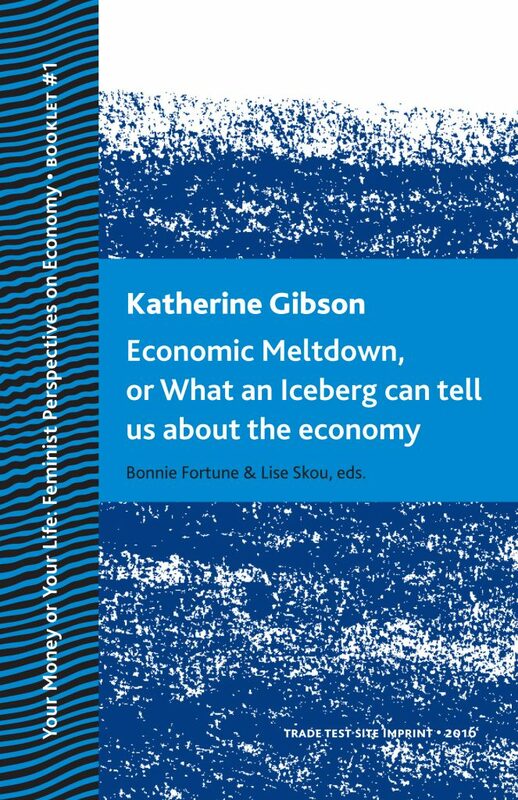 The four women authors are responsible for creative opinions and approaches as to how we, as a culture, might come to inhabit different economic realities. Capitalist processes shape our daily experiences but do they define them? 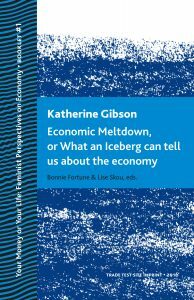 How and where are people creating economies that ignore the dominant economic system? How do these economies–shared, exchange based, micro-local, etc.–function and what do they look like? Are they temporary or are they sustainable? 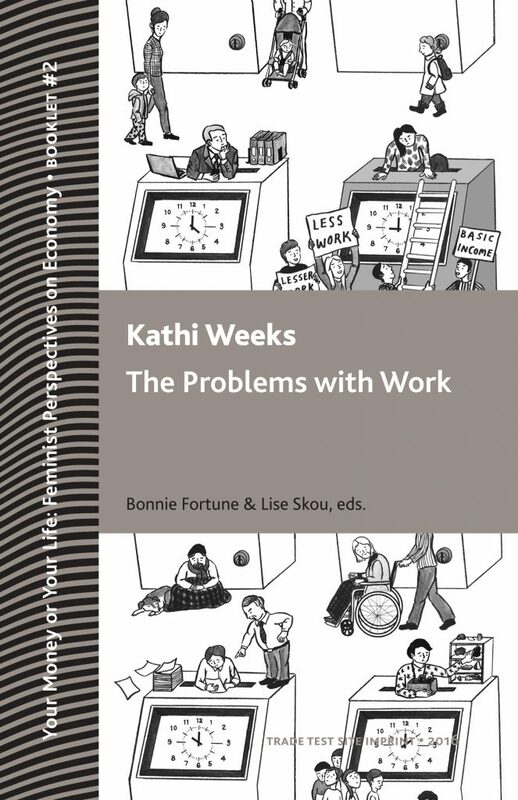 We continue this thinking with this series of publications that poke holes in the fabric of capitalism with ideas, theories, and independent trade based projects. 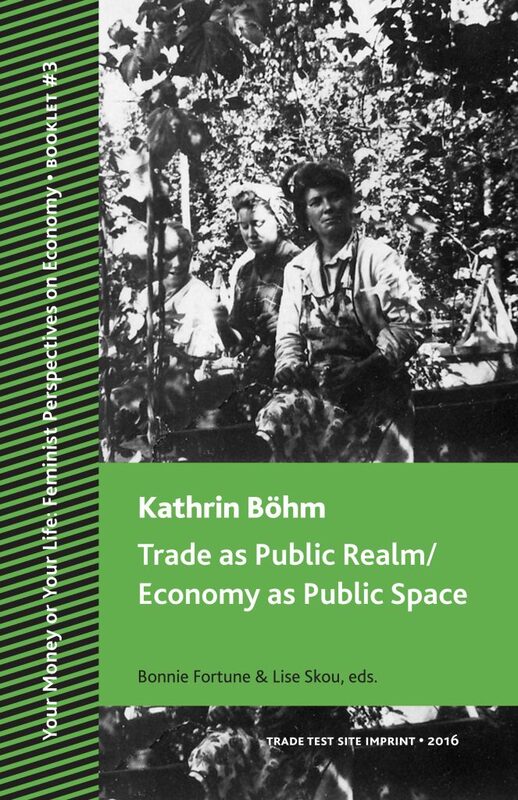 For the initial publication, we are reprinting Katherine Gibson’s contribution to the exhibition “Trade Show” (2013-2014) curated by Kathrin Böhm and Gavin Wade. “Trade Show” explored culturally based economic experiments and practices and different approaches to the concept of trade. 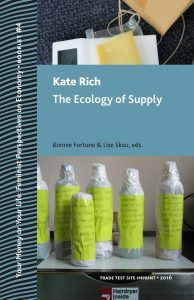 Curator Kathrin Böhm contributes the second book with an essay on her project Company, a community-based economic experiment in creating a sustainable drinks industry on the outskirts of London. 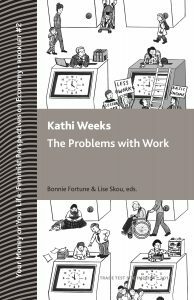 Marxist-feminist scholar, Kathi Weeks discusses the precarity of waged labor in the third book in the series, with her article “The Problems with Work.” Artist, Kate Rich’s text on Feral Trade, her ongoing hand-delivered grocery business, which trades goods over social networks concludes the series. Please enjoy, and if you share your book with a friend be sure you trade her for something else. P.S. Coincidentally, they all of the authors are named Katherine. Booklet # 1, published October 2016. Booklet # 2, published October 2016. Booklet # 3, published October 2016. My involvement with art and its relation to economy begins with my interest in public space. Public space is where we articulate and offer ideas and goods in order to pass them on through negotiation and agreements over value. I see economy as a public space where we meet to go through these negotiations and exchanges. It is a public which we shape through how we produce, trade and invest. My decision to become an artist was about being able to negotiate ideas and values in public without having to represent a particular ideology or profession. In my work, I focus on everyday socio-physical spaces and how to make or keep them complex, multi-functional, and multi-cultural – the opposite of mono-cultural. Cultural work, for me, is to have public action and discussion about possible realities for the world in which we live. Feral Trade is a grocery business, art endeavor, and long range economic experiment trading goods over social networks and outside commercial systems. The word ‘feral’ describes a state which is wilfully wild, or street wild (s a pigeon), as opposed to the more romantic interpretation of prairie wild, or tundra wild (as in eagle or wolf). In terms of trade, this moves away from folkloric (re)vision of the silk-road merchant towards a trade operation run in a contemporary urban habitat. Goods are dispatched worldwide in the spare baggage space of friends, colleagues, and passing acquaintances, harnessing the surplus freight potential of existing movements. A social protocol run over time and with no tangible assets, Feral Trade materialises an underground freight network at least as robust and reliable as FedEx, UPS, or DHL.